© Carpinteiro and Barros; Licensee Bentham Open. The shoulder is the most complex joint in the body. The large freedom of motion in this joint is the main cause of instability. Instability varies in its degree, direction, etiology and volition and there is a large spectrum of conditions. What happens in the shoulder after the first dislocation? Which structures suffer damage? Who are the patients at higher risk of recurrence? How does the disease evolve without treatment? Will surgical treatment avoid future negative outcomes and prevent degenerative joint disease? Who should we treat and when? 80% of anterior-inferior dislocations occur in young patients. Recurrent instability is common and multiple dislocations are the rule. Instability is influenced by a large number of variables, including age of onset, activity profile, number of episodes,delay between first episode and surgical treatment. Understanding the disease and its natural evolution is determinant to decide the treatment in order to obtain the best outcome. It is crucial to identify the risk factors for recurrence. Delay in surgical treatment, when indicated, leads to worse results. Surgical technique should address the type and severity of both soft tissue and bone lesions, when present. Keywords: Shoulder, Instability, Natural, History, Recurrence, Managment. The shoulder is considered the most mobile and complex joint in the body. It is precisely the wide range of motion that causes its vulnerability to instability. A pathological capsuloligamentous complex leads to instability and this condition should be distinguished from constitutional laxity that does not cause symptoms. Instability varies in its degree (subluxation, dislocation and micro-instability), direction (anterior, inferior, posterior and multidirectional), etiology (traumatic or atraumatic) and volition (voluntary or involuntary). Therefore there are a large spectrum of conditions between traumatic and atraumatic, besides severity, laxity degree, direction and volition. Anterior shoulder dislocations occur in approximately 2% of the population with 80% of dislocations occurring in younger patients . Anterior traumatic dislocation is the most common injury pattern and constitutes about 96% of all glenohumeral dislocations . Recurrent instability after the first episode is common and multiple dislocations are the rule. Understanding the disease and its natural evolution helps the physician decide on individual treatment and intervention selection in order to obtain the best outcome. It is crucial to identify the risk factors for recurrent instability and to bear in mind the differences among specific populations. In fact the main issue is the prediction of the natural history for specific individuals and populations. 1 – What happens in the shoulder after the first dislocation? Which structures suffer damage? 2 - Who are the patients at higher risk of recurrence? 3 - How does the disease evolve without treatment? 4 – Will surgical treatment avoid future negative outcomes and prevent degenerative joint disease? 5 – Who should we treat and when? 1. WHAT HAPPENS IN THE SHOULDER AFTER THE FIRST DISLOCATION EPISODE? WHICH STRUCTURES SUFFER DAMAGE? When a traumatic glenohumeral anterior dislocation occurs, the soft tissue and/or bony stabilizers suffer inevitable damage, but the severity and nature of the lesions produced are highly variable. Avulsion of the anterior labrum and capsule from the glenoid rim is the most frequent and constant described lesion and includes the classic Bankart lesion (Fig. 1) . It is reported in up to 83,4% of cases in acute and chronic anterior instability patients . Fig. (1). Left shoulder Bankart lesion –arthroscopic view. The anterior labrum increases the joint surface area and acts like an anterior and inferior bumper, it is a negative pressure keeper but, above all, it is the proximal insertion of the glenohumeral ligaments, especially the inferior one, therefore it is a major passive anterior stabilizer [5, 6]. The inability of healing and restoring the original anatomy and its physical properties is an essential cause of recurrence. The resistance to external rotation is provided by the antero-inferior structures, especially the inferior glenohumeral ligaments (Fig. 2), which act like a hammock, retaining the humeral head in place . An isolated Bankart lesion is not sufficient to produce a dislocation . The plastic deformation of the ligaments and capsule or even its rupture, the vicious healing position, the combination of damaged structures and the non healing process are responsible for the identification of a wide spectrum of previously described lesions in several “lines”, such as Bankart, Perthes, ALPSA , capsular lesions and GLAD  (Figs. 3a and b). Furthermore, the notion that some of these forms are evolutions in severity from others is crucial for its understanding and reparation. In fact, when repetitive dislocations occur, a simple Bankart lesion may evolve into a combined lesion, with the development of a more sever capsular and/or bone lesion. Fig. (2). 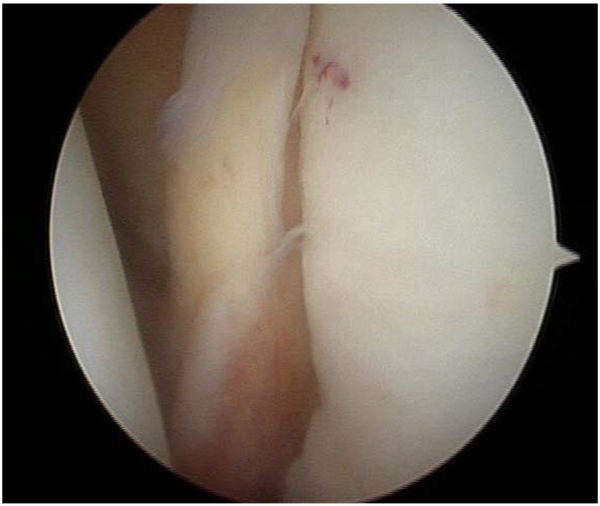 a) - ALPSA lesion and b) – GLAD lesion –arthroscopic view. Other soft tissue lesions are often encountered, such as superior labral lesions, rotator interval capsular rupture  and cuff tears. The last one is particularly important to maintain the concavity-compression effect, and their prevalence is higher in adults and the elderly after the first dislocation . We must bear in mind this structural complexity, the interactions between its components, and their role in stability. Only then we are prepared to treat the different types of lesions. Fig. (3). Inferior glenohumeral ligament lesion – Artro-MRI (Hospital da Luz Imaging department). There are two types of glenoid defects: the fragment type (Fig. 4) and the erosion type. After the first dislocation the incidence of glenoid bone lesion is around 40% . Among the shoulders with recurrent anterior dislocations, 50% presented the fragment type, while 40% presented the erosion type. This means that only 10% of those with a recurrent anterior dislocation have an intact glenoid . The glenoid defect is related to the number of dislocations and the age of initial dislocation . Fig. (4). (a)- Bony Bankart – MRI image (Hospital da Luz Imaging department) b) Arthroscopic view (from the author). Osseous avulsion of the anterior glenoid rim, the so called bony Bankart, is more frequent that we realize [16, 17]. Cadaver studies have shown that an osseous defect in which the width is at least 20% of the glenoid length can cause instability of the shoulder . The “inverted pear” lesion is the most known type, however, lesser lesions such as “straight pear” are more common. The difference between these two is the amount of glenoid bone defect, which implies different surgical approaches for its reparation. The impression fracture of the humeral head (the Hill-Sachs lesion)  is present in most patients after an anterior dislocation. The incidence of a Hill–Sachs lesion Fig. (5a) increases with an increased number of dislocations: Incidence ranges from 65% to 67% after initial dislocation and from 84% to 93% after recurrent dislocations [19, 20]. The lesion is usually small and does not contribute to instability and recurrence. When the defect involves more than 30% of the humeral articular surface, has horizontal direction and it is located more medially, it may ‘engage’ with the anterior glenoid during abduction and external rotation of the arm, causing re-dislocation. It is very important to understand the “on-track” and “off-track” concepts  Fig. (5b) and also the “engaging concept” . Fig. (5). (a) – Glenoid track-concept from Itoi et All (b) - Hill-Sachs lesion – arthroscopic view (from the author). In adults and the elderly the great tuberosity fracture-avulsion is often associated with dislocation. The facts described above are determinant to select the type of treatment and to establish a prognosis. Beware: we must consider all lesions as acting together. They are part of the same problem. 2. WHO ARE THE PATIENTS THAT HAVE A HIGHER RISK OF RECURRENCE? A first episode of anterior dislocation of the shoulder occurs more frequently in young males who practice contact sports. Instability and recurrence are a typical problem of the young population. Young males who practice contact sports have the highest rate of recurrence. The incidence of recurrence is variable for several authors , ranging from as low as 17% to close to 100% [23, 24]. The latest literature reveals an incidence of recurrent instability of 75% to 80% among individuals aged between 13 and 20 years and of 50% in those aged between 20 and 30 years [22, 25, 26]. The age at the time of the first episode is the main factor in predicting the risk for recurrent instability. According to Kralinger et al. the type of sports, type of immobilization and physical therapy are not associated with changes in the recurrence rate . The intrinsic factors at the time of the dislocation are also important. A deep Hill Sachs lesion and/or a glenoid bone lesion that reduces significantly the area of articular surface are more likely to result in recurrence. Also a severe disruption of the antero-inferior capsular ligament complex is correlated with recurrence. Concomitant hyperlaxity is another important factor related with rate of recurrence . The assessment of the extrinsic and intrinsic factors at the time of the first episode is determinant in order to establish the treatment protocol. Boileau et al. have identified six major variables or risk factors for recurrence: a patient aged less than 20 years at the time of surgery, sports involving contact or forced overhead activity, sport practice at a competitive level; shoulder hyperlaxity; a superior Hill-Sachs lesion visible in external rotation, and a loss of contour of the inferior glenoid on a plain AP radiograph . Earlier return to sports by the young population, familiar factors, capsule-labral lesion and frequent bony glenoid and humeral lesions are probably responsible for higher recurrence rates in the young population. 3. HOW DOES THE DISEASE EVOLVE WITHOUT SURGICAL TREATMENT? After the first episode of glenohumeral dislocation the traditional procedure is shoulder immobilization for a period of three weeks, followed by a rehabilitation protocol. The immobilization position is usually the so called standard (IR, neutral F and ABD with elbow 90º F), however in 2003 a new method of immobilization in external rotation was described by Japanese authors which revealed that this position can reduce significantly the rate of recurrence . These findings were recently confirmed by two other studies [31, 32] On the other hand it seems that the length of the immobilization period does not affect the rate of recurrence . If the intra articular lesions heal in a way that the joint remains stable there is no recurrence and we must assume that the disease ends at that point. This occurs in a minority among young population . When they do not heal properly and the joint remains unstable, recurrence is most likely. In these cases the nature and severity of the initial soft tissue and/or bone injuries and the patient activity profile are determinant to the number and frequency of subsequent episodes. The first episode produces several types of soft tissue lesions  with variable severity. These lesions worsen with recurrence, which in turn depends on the patient’s activity and the initial lesion type and severity. The capsular-ligament incompetence increases with the amount of plastic deformity, producing a lax complex and a larger inferior pouch. The main passive anterior restraints are lost, opening a free way to recurrence. Concerning the bone lesions, and as stated above, the glenoid defect is related to the number of dislocations and/or subluxations and the age of initial dislocation . Humeral head compression fracture (Hill-Sachs), becomes more prevalent with recurrence [20, 34]. Probably the size and depth of these lesions increase with recurrence episodes and some non engaging lesions become engaging. It is known that with shoulder dislocation the articular cartilage suffers damage. In 1993, Norlin arthroscopically evaluated 24 patients one to 3 days after the dislocation. He reported 100% of chondral lesions and 25% of osteochondral lesions . Later, in a similar study, Taylor and Arciero arthroscopically evaluated a series of patients 10 days after the first episode, and the results also revealed a significant number of chondral and osteochondral lesions of the humeral head . In 2003, Cameron et al. published an important study with a large series of acute and chronic instability patients, and they found a significant association with chondral lesions. There was no difference between acute and chronic patients but there was a significant association with time between first episode and surgery, not only with the presence of chondral lesions but also with is severity . Inevitably, with increasing instability the joint structures degrade, leading, in some cases, to osteoarthritis. In 2002, an interesting paper was published, showing an association between instability and osteoarthritis. Marx et al. reviewed patients submitted to shoulder arthroplasty for arthritis. He found that the odds ratio for developing osteoarthritis after a shoulder dislocation was 19,3. He also found that the risk of developing severe osteoarthritis of the shoulder is between 10 and 20 times greater for individuals who have had a dislocation of the shoulder . Recently a Geneva University Hospital shoulder department presentation called our attention to another aspect in patients with recurrence. They produced the first study that correlates apprehension with central nervous system modifications, like cerebral remodeling with significant increase in functional connectivity, notably in the ipsilateral motor and general anxiety circuit-related areas, and demonstrated that a peripheral orthopedic pathology could lead to a central neurological impairment . In conclusion, in the non-treated shoulder with recurrent instability we can expect, on the long-term, degenerative joint disease and an earlier decreased function, cause professional and sports restrictions, with other repercussions beyond the skeletal muscular system. 4. WILL SURGICAL TREATMENT PREVENT DEGENERATIVE JOINT DISEASE AND AVOID FUTURE NEGATIVE OUTCOMES? Neer was the first author to identify patients with shoulder degenerative osteoarthritis who had a previous surgical repair for instability . Samilson and Prieto described the condition called dislocation arthropathy, and noted that this condition appears also in patients with a single dislocation episode and non-operative treatment . The study of the relation between osteoarthritis Fig. (6) and instability is difficult. There are many variables and the period between the first episode and the appearance of degenerative changes is too long . Fig. (6). Glenohumeral osteoarthritis – arthroscopic view (from the author). Surgical procedures to correct instability are known to increase the probability of glenohumeral osteoarthritis, particularly when there is significant loss of external rotation . The long-term implications of the increasingly popular arthroscopic stabilization are yet to be determined, as there is no sufficient long-term follow-up data. However, in 2011 Franceshi et al. reported the development of osteoarthritic changes after arthroscopic Bankart repair in 21% of cases. He also found a significantly statistical association between the number of anchors used at surgery and arthritis  Our hope is for better long-term outcomes. How to avoid negative outcomes? In our opinion, it is not acceptable to consider a stabilization surgical procedure only to prevent osteoarthritis. On the other hand, a successful surgery means a pain-free shoulder, with good function and no recurrence. The overall results after open or arthroscopic surgery are good [17, 18]. Various open and arthroscopic techniques exist to address unidirectional anterior shoulder instability. An individualized treatment approach, based upon the patient’s injury pattern and expectations, will likely lead to the most successful outcome . When we address young patients with anterior glenohumeral instability, the recurrence rate is high and the surgical treatment is, in most cases, the best option. In the majority of operated patients, the return to active professional life, sports and others without apprehension is the rule [44-47]. So we believe that surgery will produce good outcomes and the result is largely positive. In acute patients without significantly bone lesions and good soft tissue quality we perform arthroscopic anterior stabilization (Fig. 7). If we find an engaging Hill-Sachs lesion we associate a remplissage procedure. In patients with large bone lesions, or with poor soft tissue quality and multiple episodes we prefer the Latarjet procedure. Fig. (7). 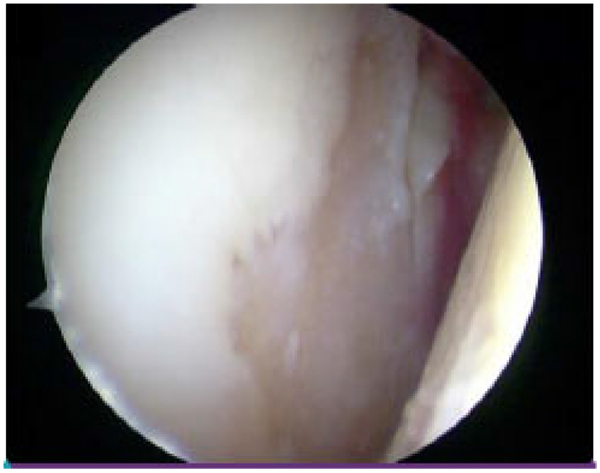 Arthroscopic labrum repair (from the author). 5. WHO SHOULD WE TREAT AND WHEN? There are several instability classifications to establish prognosis and treatment indication and none are 100% accurate. Rowe  divided the patients with instability into two groups: Traumatic and atraumatic. Later, Matsen created the TUBS and AMBRI concepts  (torn loose and born loose). With time, orthopedic surgeons became aware of a wide spectrum of patient types within these groups. Lewis, in 2004, proposed three polar types and a sort of migration between them (Stanmore classification). In 2007 Castagna proposed a classification for minor instability – AIOS  and recently Angel Calvo created his MIQ system (mechanism, injury, quality) . In 2007, Balg and Boileau published a prospective case-control study of 131 consecutive unselected patients with recurrent anterior shoulder instability who underwent Bankart procedure using suture anchors. They developed a score, very popular in our days, called Instability Severity Index Score (ISIS)  to predict which patients will suffer recurrent instability and to establish the correct indication concerning surgical technique. Although glenoid bone loss, anterior hyperlaxity, and a Hill-Sachs lesion are known risk factors for failure of arthroscopic stabilization, they valued other factors, such as age, degree of sports participation and type of sport. Our opinion about who we should treat is the following: in general, patients with recurrent instability will benefit from surgery. The type of technique must be chosen according to the type and degree of soft tissue and/or bone lesions and individual characteristics, namely age and activity profile. The other issue is when to treat. We are convinced, according to the previous considerations in this chapter, that operative treatment after the first episode is the most rewarding procedure, and this is especially true if the patient has a competition and contact sport profile, or a high risk professional activity. However, in most cases, patients have two or more dislocation episodes before reaching our office. Our goal is to treat them as soon as possible. Those who are not candidates for surgical treatment, for medical reasons or others, should restrict their risk activities and follow a suitable rehabilitation protocol. To Dr. Miguel Ruiz Iban for the opportunity granted to share our knowledge and experience in the fore mentioned subject. Owens BD, Duffey ML, Nelson BJ, DeBerardino TM, Taylor DC, Mountcastle SB. The incidence and characteristics of shoulder instability at the United States Military Academy. Am J Sports Med 2007; 35(7): 1168-73. Goss TP. Anterior glenohumeral instability. Orthopedics 1988; 11(1): 87-95. Bankart AS. Recurrent or habitual dislocatoin of the shoulder-joint. BMJ 1923; 2(3285): 1132-3. Baker CL, Uribe JW, Whitman C. Arthroscopic evaluation of acute initial anterior shoulder dislocations. Am J Sports Med 1990; 18(1): 25-8. Taylor DC, Arciero RA. Pathologic changes associated with shoulder dislocations. Arthroscopic and physical examination findings in first-time, traumatic anterior dislocations. Am J Sports Med 1997; 25(3): 306-11. Neviaser TJ. 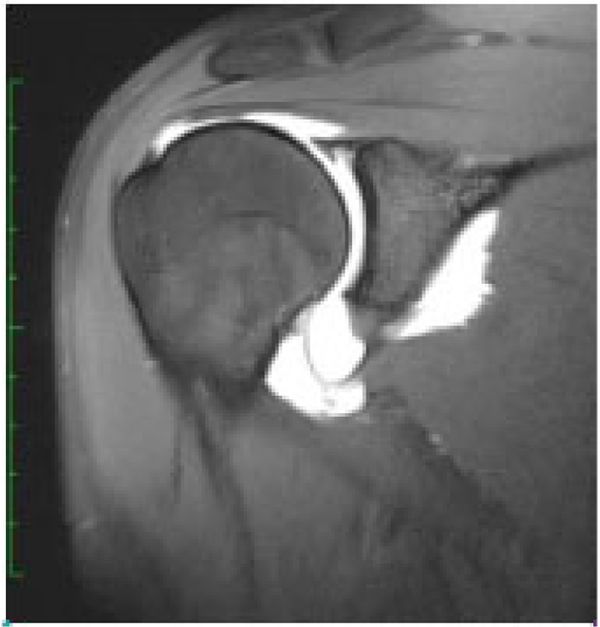 The GLAD lesion: another cause of anterior shoulder pain. Arthroscopy 1993; 9(1): 22-3. Levine WN, Flatow EL. The pathophysiology of shoulder instability. Am J Sports Med 2000; 28(6): 910-7. Atef A, El-Tantawy A, Gad H, Hefeda M. Prevalence of associated injuries after anterior shoulder dislocation: a prospective study. Int Orthop 2015; 1-6. [SICOT]. Kim D-S, Yoon Y-S, Yi CH. Prevalence comparison of accompanying lesions between primary and recurrent anterior dislocation in the shoulder. Am J Sports Med 2010; 38(10): 2071-6. Itoi E, Yamamoto N, Kurokawa D, Sano H. Bone loss in anterior instability. Curr Rev Musculoskelet Med 2013; 6(1): 88-94. Milano G, Grasso A, Russo A, et al. Analysis of risk factors for glenoid bone defect in anterior shoulder instability. Am J Sports Med 2011; 39(9): 1870-6. Bigliani LU, Newton PM, Steinmann SP, Connor PM, Mcllveen SJ. Glenoid rim lesions associated with recurrent anterior dislocation of the shoulder. Am J Sports Med 1998; 26(1): 41-5. Porcellini G, Campi F, Paladini P. Arthroscopic approach to acute bony Bankart lesion. Arthroscopy 2002; 18(7): 764-9. MD AA. Hill-Sachs remplissage, an arthroscopic solution for the engaging Hill-Sachs lesion: 2- to 10-year follow-up and incidence of recurrence. J Shoulder Elbow Surg 2013; 1-7. Spatschil A, Landsiedl F, Anderl W, et al. Posttraumatic anterior-inferior instability of the shoulder: arthroscopic findings and clinical correlations. Arch Orthop Trauma Surg 2006; 126(4): 217-22. Burkhart SS, Debeer JF, Tehrany AM, Parten PM. Quantifying glenoid bone loss arthroscopically in shoulder instability. Arthroscopy 2002; 18(5): 488-91. Hovelius L, Augustini BG, Fredin H, Johansson O, Norlin R, Thorling J. Primary anterior dislocation of the shoulder in young patients. A ten-year prospective study. J Bone Joint Surg Am 1996; 78(11): 1677-84. Henry JH, Genung JA. Natural history of glenohumeral dislocationrevisited. Am J Sports Med 1982; 10(3): 135-7. Postacchini F, Gumina S, Cinotti G. Anterior shoulder dislocation in adolescents. J Shoulder Elbow Surg 2000; 9(6): 470-4. Rowe CR. Prognosis in dislocations of the shoulder. J Bone Joint Surg Am 1956; 38-A(5): 957-77. Kirkley A, Griffin S, Richards C, Miniaci A, Mohtadi N. Prospective randomized clinical trial comparing the effectiveness of immediate arthroscopic stabilization versus immobilization and rehabilitation in first traumatic anterior dislocations of the shoulder. Arthroscopy 1999; 15(5): 507-14. Kralinger FS, Golser K, Wischatta R, Wambacher M, Sperner G. Predicting recurrence after primary anterior shoulder dislocation. Am J Sports Med 2002; 30(1): 116-20. Habermeyer P, Jung D, Ebert T. Treatment strategy in first traumatic anterior dislocation of the shoulder. Plea for a multi-stage concept of preventive initial management. Unfallchirurg 1998; 101(5): 328-41. Balg F, Boileau P. The instability severity index score. A simple pre-operative score to select patients for arthroscopic or open shoulder stabilisation. J Bone Joint Surg Br 2007; 89(11): 1470-7. Itoi E, Hatakeyama Y, Kido T, et al. A new method of immobilization after traumatic anterior dislocation of the shoulder: a preliminary study. J Shoulder Elbow Surg 2003; 12(5): 413-5. Momenzadeh OR, Pourmokhtari M, Sefidbakht S, Vosoughi AR. Does the position of shoulder immobilization after reduced anterior glenohumeral dislocation affect coaptation of a Bankart lesion? An arthrographic comparison. J Orthop Traumatol 2015; 16(4): 317-21. Heidari K, Asadollahi S, Vafaee R, et al. Immobilization in external rotation combined with abduction reduces the risk of recurrence after primary anterior shoulder dislocation. J Shoulder Elbow Surg 2014; 23(6): 759-66. 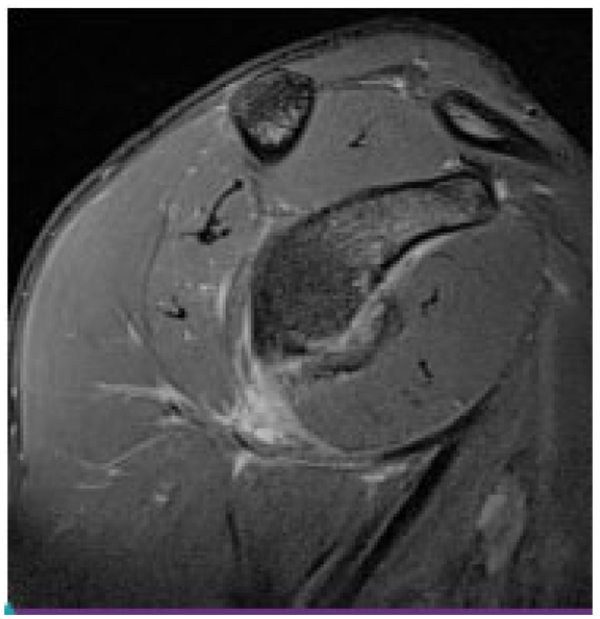 Norlin R. Intraarticular pathology in acute, first-time anterior shoulder dislocation: an arthroscopic study. Arthroscopy 1993; 9(5): 546-9. Cameron ML, Kocher MS, Briggs KK, Horan MP, Hawkins RJ. The prevalence of glenohumeral osteoarthrosis in unstable shoulders. Am J Sports Med 2003; 31(1): 53-5. Marx RG, McCarty EC, Montemurno TD, Altchek DW, Craig EV, Warren RF. Development of arthrosis following dislocation of the shoulder: a case-control study. J Shoulder Elbow Surg 2002; 11(1): 1-5. Haller S, Cunningham G, Laedermann A, et al. Shoulder apprehension impacts large-scale functional brain networks. Am J Neuroradiol 2014; 35(4): 691-7. Neer CS, Watson KC, Stanton FJ. Recent experience in total shoulder replacement. J Bone Joint Surg Br 1982; 64(3): 319-37. Brophy RH, Marx RG. Osteoarthritis following shoulder instability. Clin Sports Med 2005; 24(1): 47-56. Plath JE, Feucht MJ, Saier T, et al. 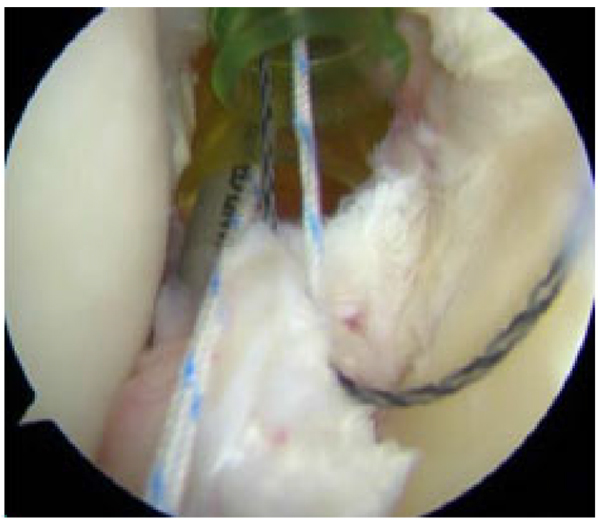 Sporting activity after arthroscopic bankart repair for chronic glenohumeral instability. Arthroscopy 2015; 31(10): 1996-2003. Cho NS, Yoo JH, Rhee YG. Management of an engaging Hill-Sachs lesion: arthroscopic remplissage with Bankart repair versus Latarjet procedure. Knee Surg Sports Traumatol Arthrosc 2015; 1-8. Yamamoto N, Kijima H, Nagamoto H, et al. Outcome of Bankart repair in contact versus non-contact athletes. Orthop Traumatol Surg Res 2015; 101(4): 415-9. Plath JE, Feucht MJ, Bangoj R, et al. Arthroscopic suture anchor fixation of bony bankart lesions: Clinical outcome, magnetic resonance imaging results, and return to sports. Arthroscopy 2015; 31(8): 1472-81. Matsen FA III, Zuckerman JD. Anterior glenohumeral instability. Clin Sports Med 1983; 2(2): 319-38. Castagna A, Nordenson U, Garofalo R, Karlsson J. Minor shoulder instability. Arthroscopy 2007; 23(2): 211-5. Clasificacion hombro inestable. pdf. 2015; 1-12.